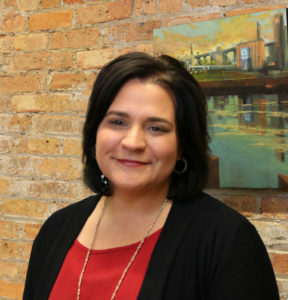 Jolena Presti, AICP Principal Planner | Vandewalle & Associates, Inc.
Jolena Presti is a Principal Planner in the Redevelopment Planning and Economic Positioning divisions of Vandewalle & Associates, and leads the Vandewalle & Associates’ Milwaukee office. Jolena’s professional practice focuses on redevelopment planning and implementation, project management, and economic development and positioning services for public and private sector clients in the greater Milwaukee region and Wisconsin’s coastal communities. Jolena is currently the project manager for redevelopment planning and implementation projects in communities throughout Wisconsin. As the project manager, Jolena oversees day-to-day client and consultant team communication, internal team management, and plan and implementation strategies development. Furthermore, Jolena’s work includes the preparation of land use plans, project feasibility analyses, developer and business recruitment, selection and project review, and facilitation of stakeholder interviews, focus groups, and public participation events. Within the last few years, Jolena has prepared redevelopment plans and advanced implementation strategies for communities including Sheboygan, Manitowoc, Jefferson, Watertown, and Cudahy, and prepared a reuse plan for the closed MPS Lee School as part of a project funded by ARRA through Milwaukee’s Social Development Commission. Prior to joining Vandewalle & Associates, Jolena was the special projects manager for a county economic development commission in California. Prior to that, she worked for the University of Washington on projects focused on economic and community development, transportation, and housing. These experiences helped Jolena gain extensive experience with project management, community development, and land use planning. You can email Jolena here.